Mom, Can I Have These Quilts? She came. She saw. She took away two quilts. Why not? It's a quilt museum here! My daughters like the modern looking quilts. 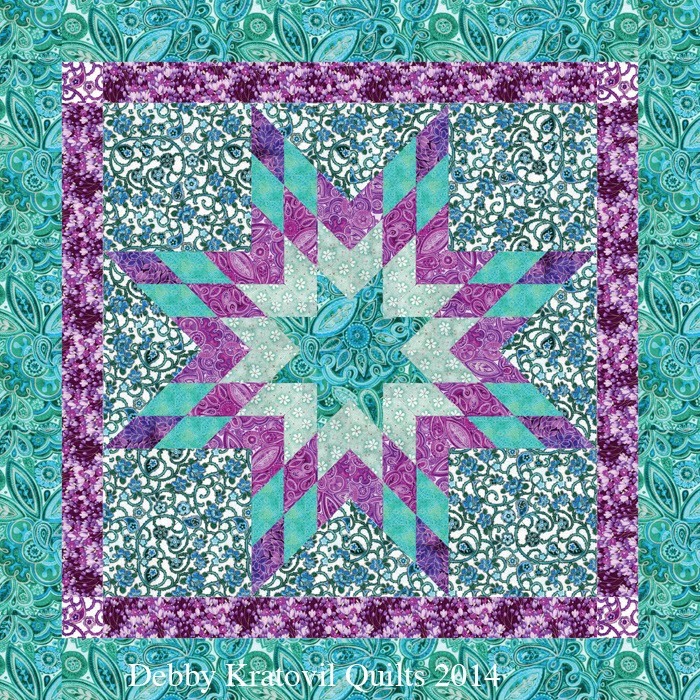 I designed 8 renditions of Gee's Bend quilts for Windham Fabrics (yes! with permission of the Gee's Bend ladies). They've served their purpose and I got paid for my work. She promised me she would actually hang these. I'm going to check up on her when I visit in January. Oh, yes I am! This one, she says, will go in my two grandsons' bedroom. The first one will hang in her office. Now I'm going to look for replacements. Remember I said that my house mimics a quilt museum. Can't have a bare wall, now can we? Stay tuned for the first block in the Galaxy of Stars Block of the Month for 2015. It comes out January 1. And Happy New Year to all! Merry Christmas to all. I wish you a wonderful year of sewing, quilting, crafting and all things creative. 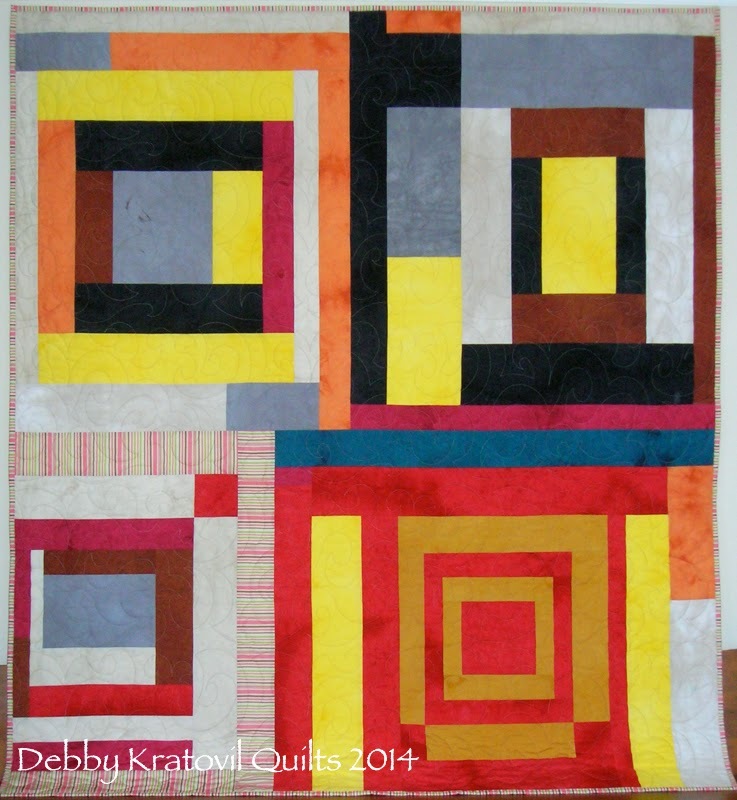 Thank you for making my blog a happy place for my quilts. They send their love and hugs to you! 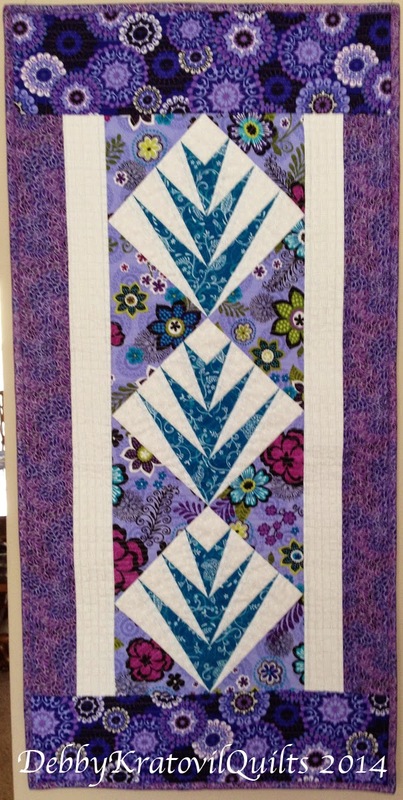 Well, I have seen (and heard) all the enthusiasm for this 2015 Block of the Month. The elves have gotten busy and informed me that the Supply List should be given out before January. They even included a coloring/planning chart for you to consider your colors. 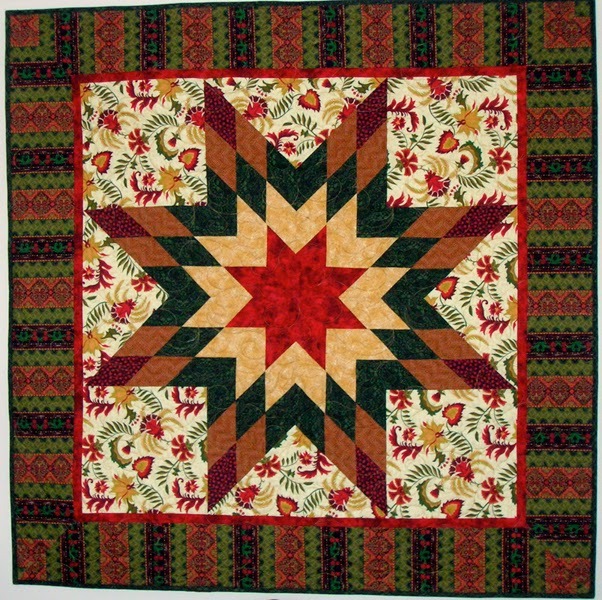 January Block, Evening Star, is NOW UP! Remember: this is not a club; you don't have to sign up. You can always remain anonymous. I will not be teaching paper piecing, so if you don't want to make a particular block with paper piecing, just make another one of your favorite rotary cut ones! 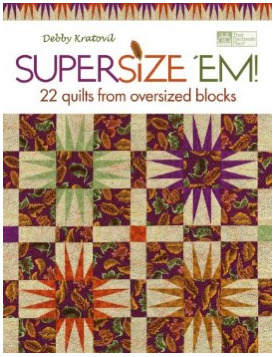 I may even share some extra blocks I've made for the workshop I taught that are not included in this quilt but use the same colors and are the same size. Here is the 3 page pdf of supplies (simple supplies; I've included both pictures of the quilts and the planning chart). Choose your own colors. Go wild with scraps. It's your quilt! Invite your friends and guild members to join in. Please ask them to come to my blog to get each monthly installment. (They may have to sign up to "follow", but I don't hassle my followers, do I?) Don't print and distribute the patterns or I'll get Willy and Nilly to come after you (my copyright protectors). Galaxy of Stars Quilt - 80" x 80"
I'm considering a Block of the Month for this blog based on this quilt. I have used it for classes and even an Atlanta quilt shop BOM. There are twelve 12" star blocks, four 6" star blocks (in the corners) and a GIANT 24" star block in the center. The Twisted Star in the center is very easy to cut and piece, I promise. What say you, blog followers? Are you interested? I would start the first week in January with one of the 12" stars. Some of them require paper piecing. I assume you either know how to paper piece or can find resources online. I won't be able to walk newbies through that process. All files are in Acrobat pdf. I will give yardage requirements in January. Each month I will offer tips for pre-cutting that month's patches. I also have a line drawing planning sheet for the 14 blocks. The last month will be a whirl with the finishing and assembly information. I've done all the work. Just need to tweak this for an online version. Let me know if you're interested. Ask your friends to join in, too. I only want to be sure that this is not printed and then handed out willy-nilly (don't know Willy? He's my copyright protector and will hunt you down and . . . you get the picture). Leave me a comment if you think you'd like to join the fun. This is not a club; you don't have to sign up. You can always remain anonymous. I'm just trying to get a head count of those who might want to take the plunge. Of course, if you're impatient, you can buy the CD for $10, plus postage. But it's free if you are OK with one block a month! There are 6 quilts for paper piecing, so you can print the foundations right from your computer. There is so much in this book. Sale ends at midnight December 21, 2014. And the quilt on the cover? Would you like to see the inspiration for this? From the Metropolitan Home Magazine - January 1982!! I tore this page out of the Metropolitan Home Magazine years ago. I carried it with me from house to house. I was so inspired by those spikey points that I just called it The Spikey Thing (though it is called "Flower Pots and Stars", circa 1920. 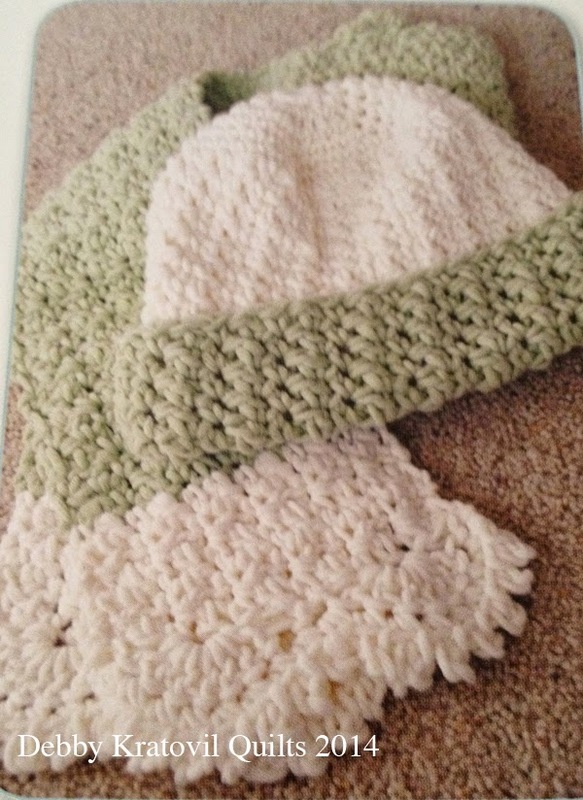 Here's your chance to get this pattern (minus the pots) along with 21 others for ONLY $6.00. Sale ends at midnight Sunday, December 21. 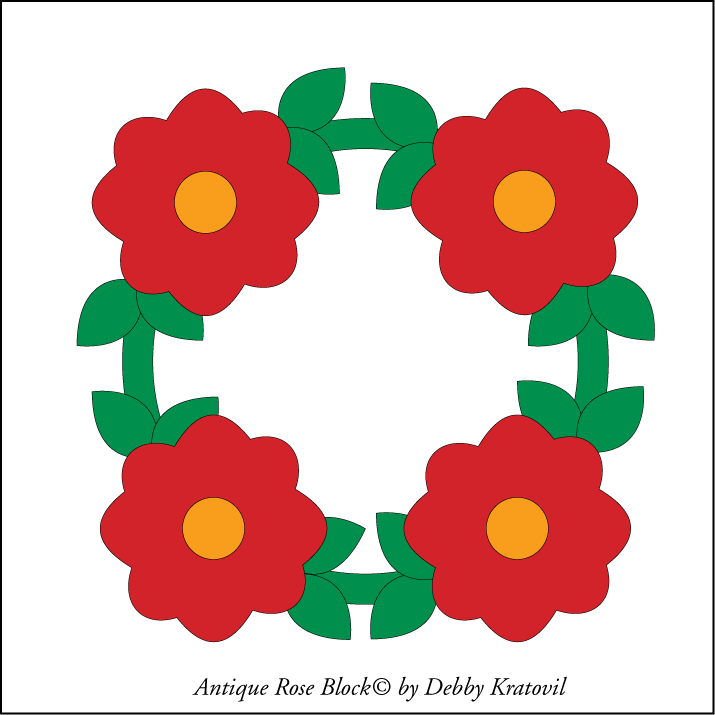 Today I feature a lovely, traditional applique block called Antique Rose, 10" x 10". 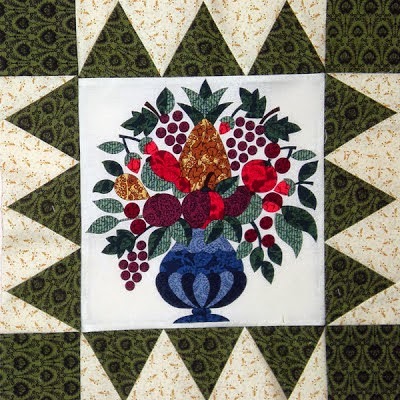 It is very similar to one of the two blocks featured in my very favorite Christmas quilt shown below. 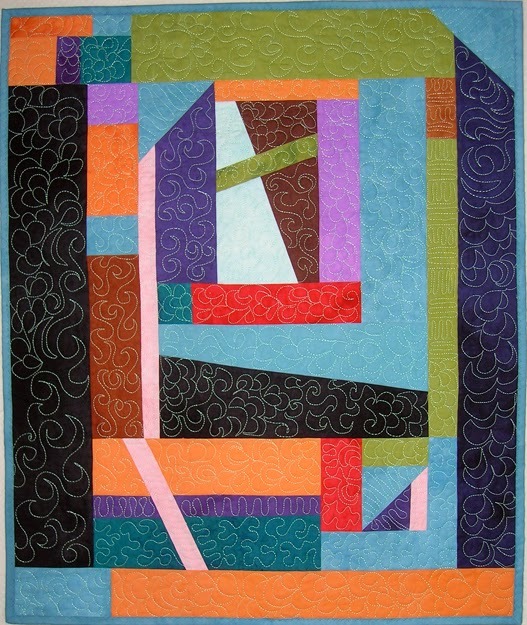 I remember beginning this quilt thinking I would hand applique. Ha! After a few stitches, I tossed the whole thing in the trash, pulled out my fusibles and happily stitched it by machine. Loved every minute. 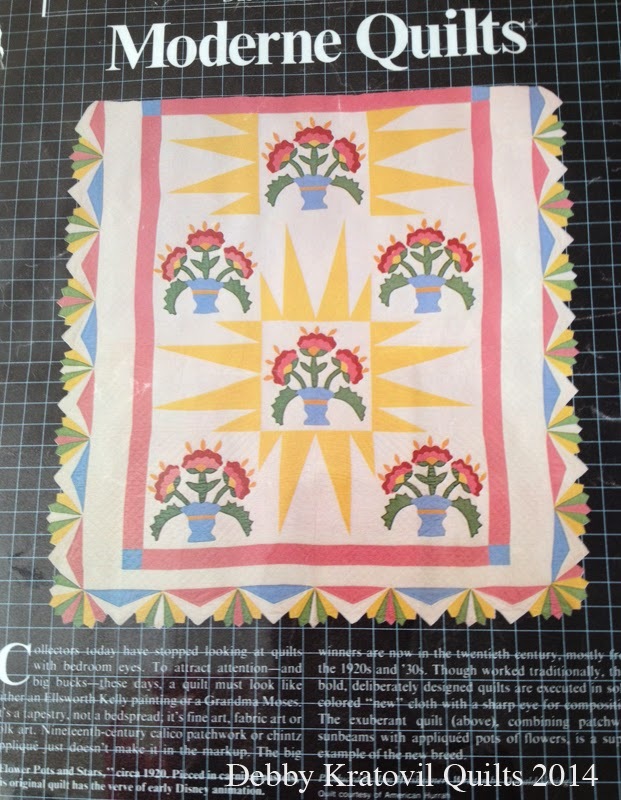 This is an antique block given to me by my then editor, Jean Ann Wright, at Quilt Magazine. It is a whopping 36" square (before borders). What do you think? I added the triple border with Nine Patch to finish it out. And, of course, I machine quilted it! What? You don't have time to sew before Christmas? Well, just save this for those crazy January days when you're housebound with snow. What? You don't get snow where you live? OK. Just save the pattern for when you have the time! 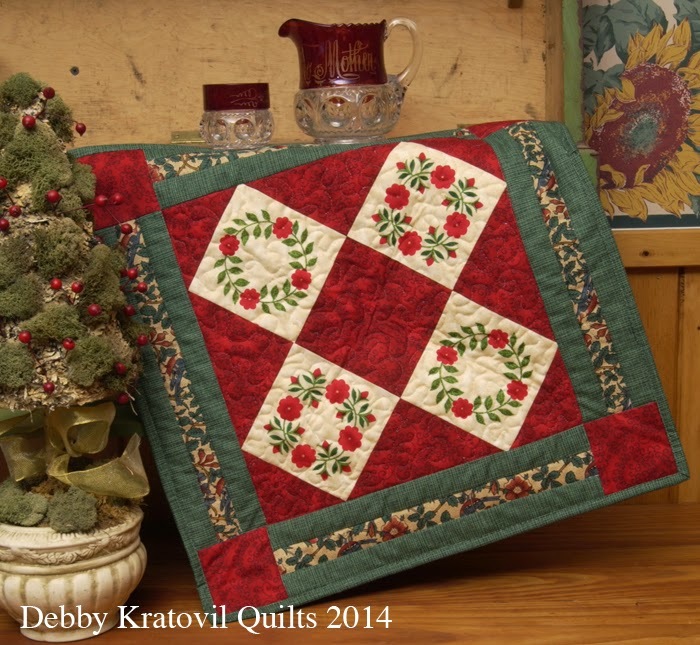 Let's see if I can find more quilts in my Christmas Quilt Vault! 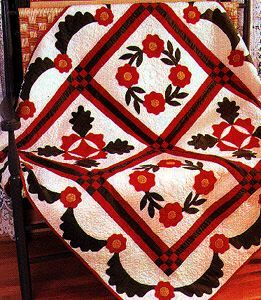 This little quilt was made at least 10 years ago and I bought a small panel of pre-printed blocks, set them on point with that deep, rich red fabric, and added a triple strip border. 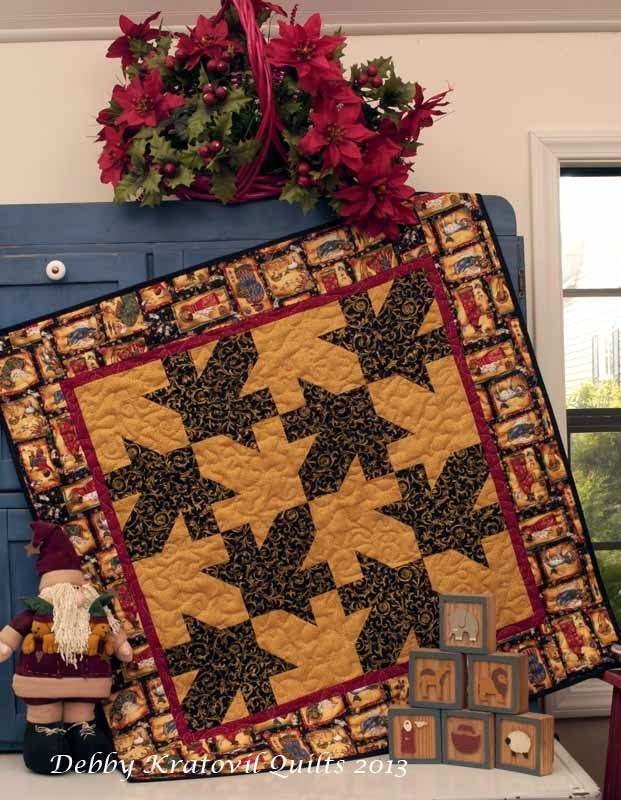 Love this little quilt and it actually hangs in my kitchen year round. 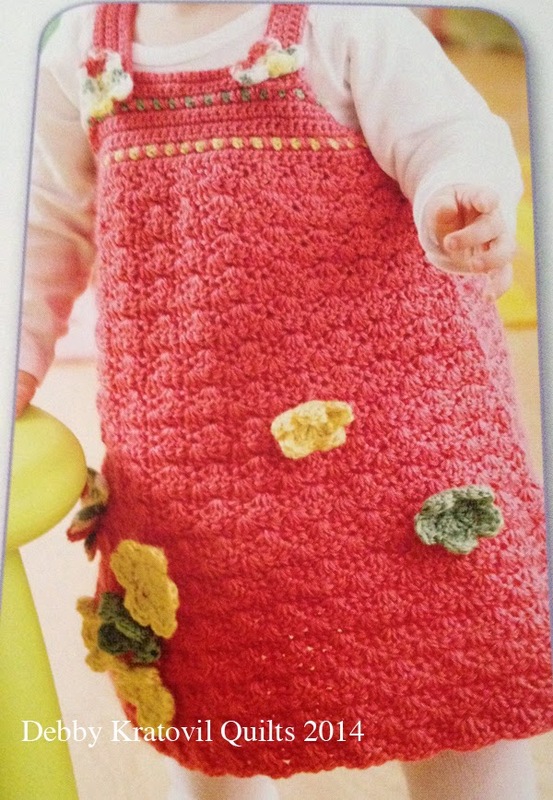 It was featured in one of Quilt Magazine's special issues and I know that made her happy! Maybe I'll go looking for that UFO box and play around with them. I just love those rich colors, don't you? 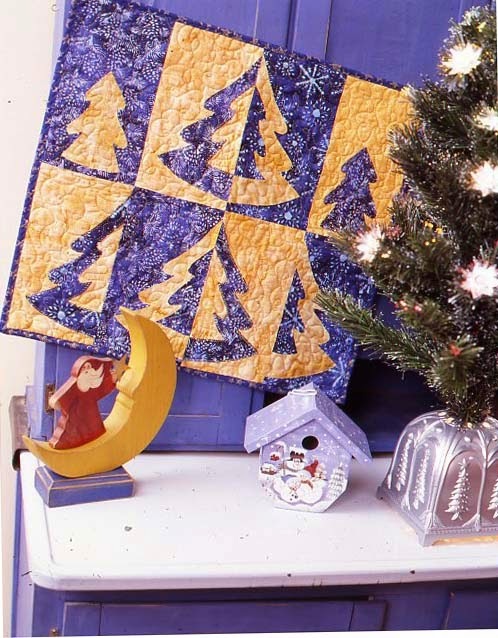 I have a few more quilts in my Christmas Quilt vault. Hope to show you some more. 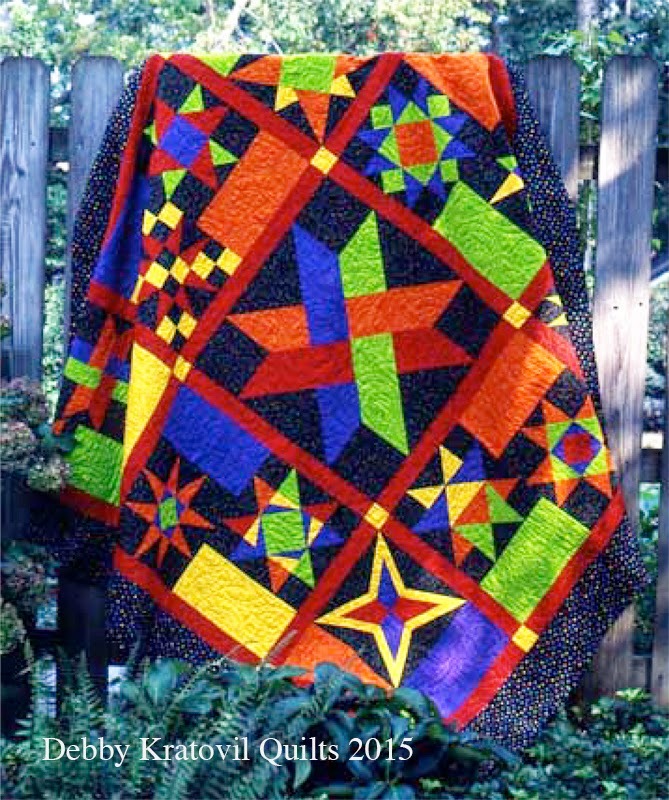 I'm pulling out my trusty, faithful, colorful Christmas quilts and I remembered this one I made about 5 years ago and turned into a class: One Day Lone Star! The center Lone Star block is about 37" square. These fabrics are so sophisticated, aren't they? They are from Blank Quilting. I created a second quilt as a pattern for Blank using their Inspiration 4 Collection. It's the same center. Would you like the pattern? It really is possible to finish the piecing of the Lone Star center in a 6 hour class when all your strips are pre-cut. Many of my students do! 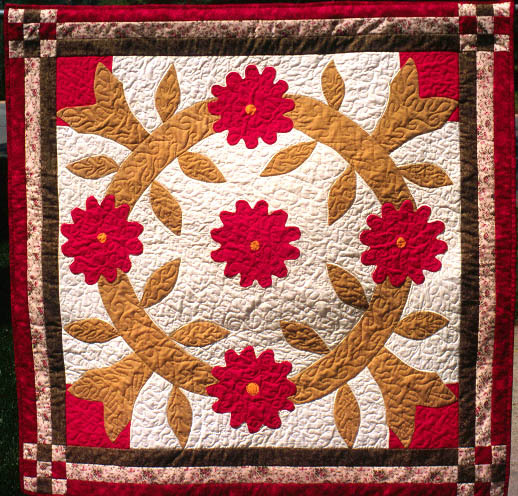 I love seeing what my students finish, and Dawn took this class at the Quilting Live! Show in Atlanta in September. This is a Palm Block, also called Hosannah. I called the class "Cupid's Arrows" because it was part of a blog hop around Valentine's Day. 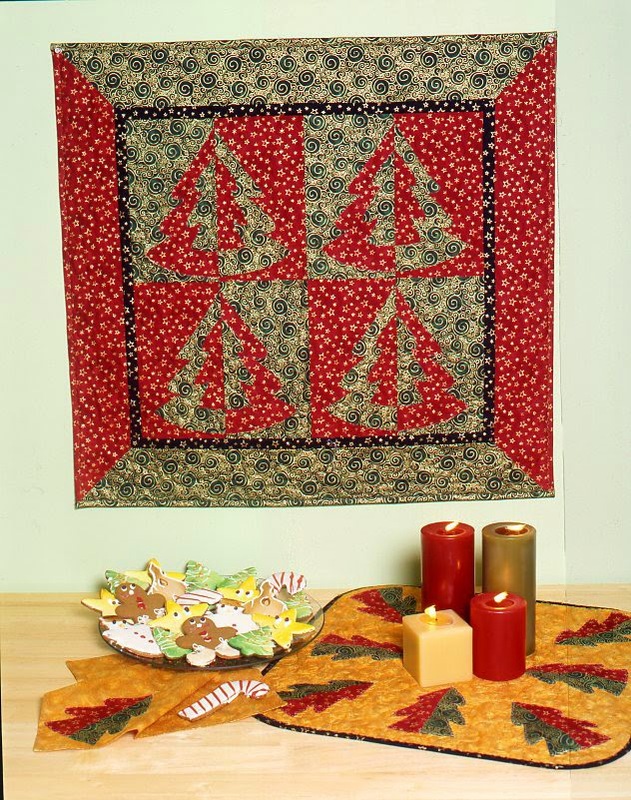 This is paper pieced and is done in an off-center log cabin approach, so that there are no units to join - when you're done piecing, the block is finished. 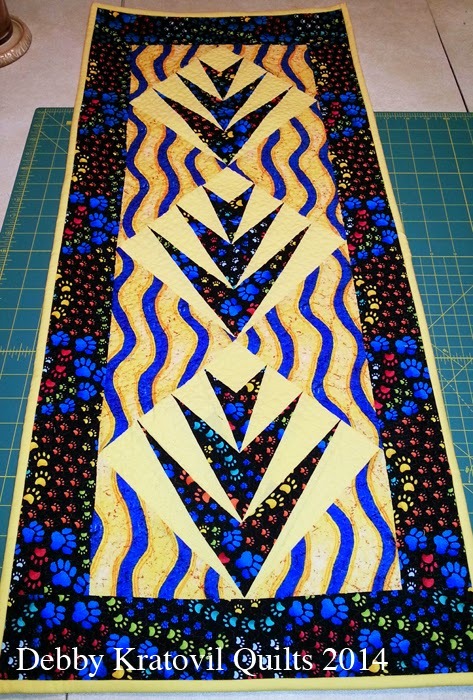 If you look closely, she used a wonderful paw print in the block and also in the border. Don't you just love you she made the best use of the curvy fabric in the setting triangles? What to GO, Dawn! The block is 7" finished. It is from my latest book, Paper Piecing Perfect Points. Students learned not only how to paper piece, but also how to set blocks on point. You can see the quilt I made for the book by following the link above. I have many several quilts using this pattern. And would you look at those pointy points? Wow!! Thanks, Dawn, for sharing this wonderful quilt with us. If you've made a quilt or table runner, etc using one of my patterns (whether in a class or on your own), please do let me know. I really want to feature them here on my blog. I remembered this post from last December and thought I'd reshare it with you. These Tessellating Leaves work with ANY fabrics, any holiday and colors. 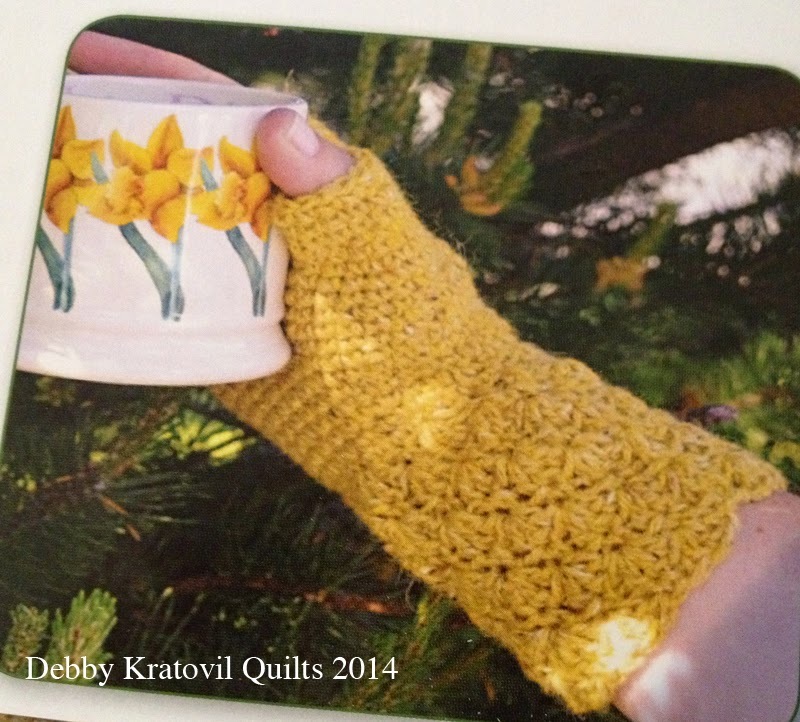 The pdf pattern is still available. If you didn't see this last year, I am happy to offer it to you. It was published many years ago in a Quilt Magazine issue and I'm so glad I have that photo! I think this would look good in red and white. Or blue and white. I found this picture from about 10 years ago. I gifted it to someone and I sure hope they are enjoying it for the holidays (can't remember who I gave it to). 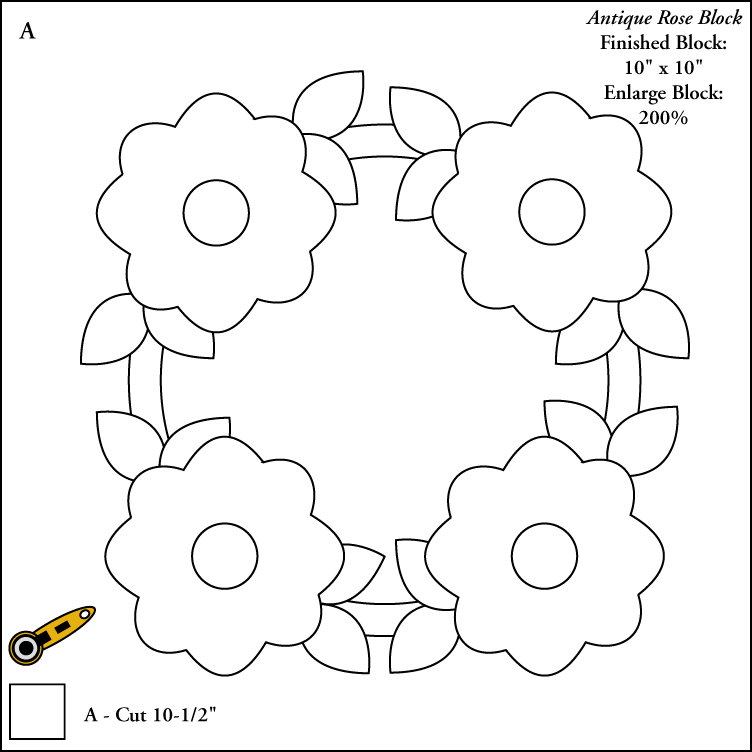 I realized that I have the pattern in pdf format and you can piece the 4" blocks either in the traditional way by rotary cutting patches or try your hand at paper piecing. The pattern is written for using fat quarters. Don't you just love the way the shapes interlock. That's what "tessellating" means. Enjoy! My own calendar publisher, Andrews McMeel, is the TOP DOG in calendars! 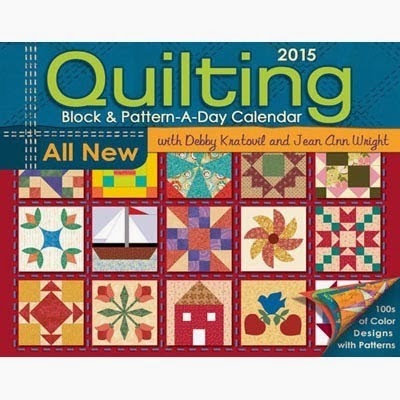 I didn't realize it until a few months ago when I did some sleuthing and discovered that they publish all sorts of calendars besides craft (quilting, crochet, knitting, etc). To a quilter, everything is a piece of fabric, I guess. Andrews McMeel Publishing is the nation's top calendar publisher, annually producing calendars based on many top-selling properties such as Dilbert, Thomas Kinkade, and Mary Engelbreit, among other characters and titles, and selling more than 15 million calendars each year. 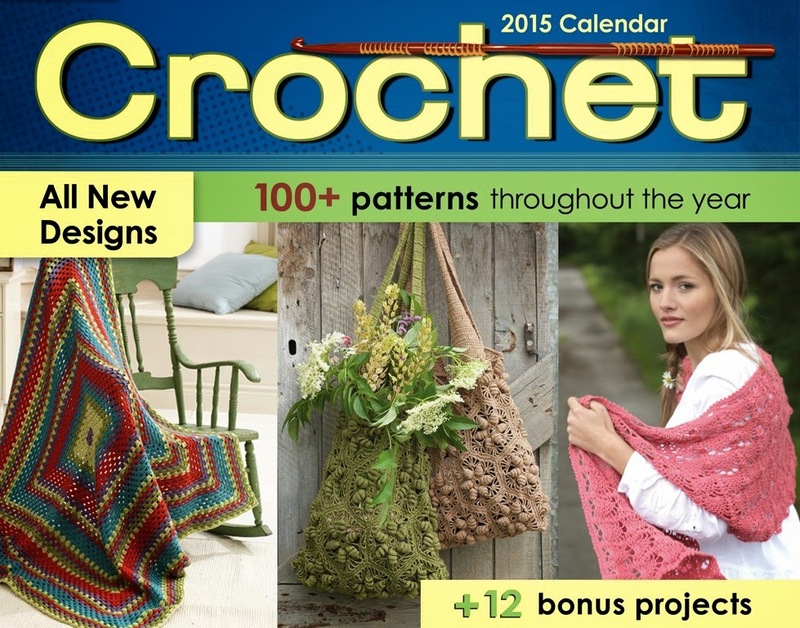 If you are a yarn junkie like me and are always looking for crochet inspiration, this calendar is for you. You can purchase it online in a variety of places, including the official Andrews McMeel calendar site. 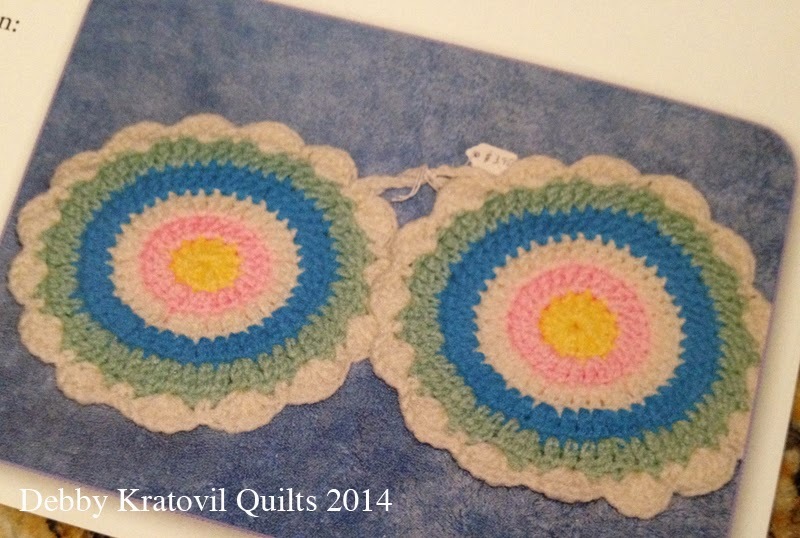 First, I want to go beyond square potholders. I've made a few dozen square ones and it's time to work on some circles! And I've been working on some wristers, but I've gotten the sizes wrong. Maybe I should be following a pattern . . . ? I have a new granddaughter and her mother loves all things girlie. I've made her 6 cowls (again, a rectangle! ); it's time to branch out. And I'm back to hats and scarves, but with a little more personality. 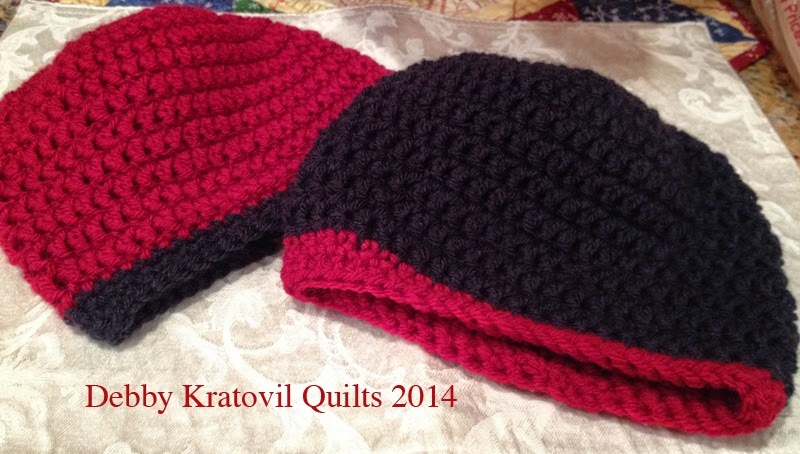 Can I show you the FIRST hats I've ever made? I found a super easy pattern on the Lion Brand site and used Paton's wool. Easy! Made these over the weekend and mailed them to my two little grandsons. I'm anxious to see if they fit. Oh, so you're not into crochet? How about knitting? Or hey - I have a great idea! How about quilting? This is the 9th calendar I've done for Accord Publishing (a division of Andrews McMeel. I've put the 2016 calendar "to bed" in August and now am working on the 2017 calendar. My brain is empty! I hope you can find it at your local big box store, quilt shop, or even online. Visit the online store of Andrews McMeel to see more about this calendar and order it!